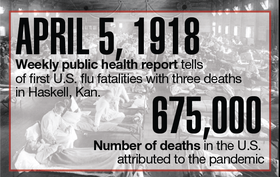 One hundred years ago this month, the “mother of all pandemics” was sweeping the world. The flu pandemic was caused by an airborne H1N1 avian virus and killed an estimated 1% to 2% of the world's population in 1918 and 1919. The victims were primarily young and often healthy adults. The pandemic struck during World War I, killing more than the 17 million who died in that conflict; it is still considered one of the deadliest disease outbreaks in recorded history. The 1918 pandemic came to be dubbed the Spanish flu not because it originated there but because Spain was neutral in the war and so reported freely on the outbreak. The U.S. and other countries at war suppressed information about the severity of the disease so as not to damage morale. Download the PDF.